To integrate with Fluttermail, simply follow the steps below. 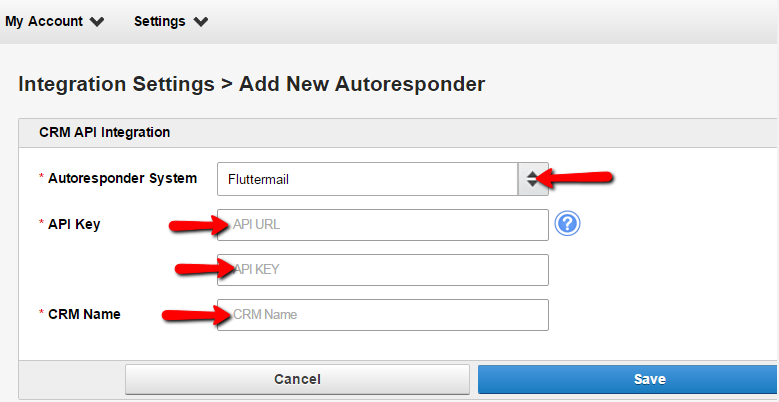 Select Fluttermail from the drop-down menu for Autoresponder System. 2. Login to your Fluttermail account. 3. On the top-right corner of your Fluttermail account, click on the button " Account". 4. Under the Settings page, find your API URL and API Key. 5. Copy your API URL and paste it in LeadsTunnel's API URL field. 6. Copy Your API Key and paste it in LeadsTunnel's API Key field.